Your Horticultural Zone, also known as your USDA Hardiness Zone, is based on average winter low temperatures in your area. It plays a big role in the types of plants you can grow in your garden. For example, if a perennial is hardy from Zones 6 to 9 and you live in Zone 4, your winters are too cold for that plant to survive from year to year. Your Horticultural Zone also helps to determine when you should start your seeds in spring. 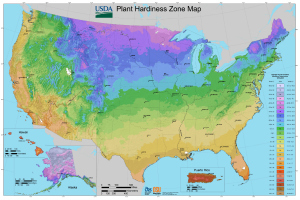 To learn more and to find your Horticultural Zone, visit the USDA Hardiness Zone Map HERE. Either enter your zip code or click on your state within the map of the United States, which will take you to a larger, zoomed-in map of your state. Pinpoint your location and use the color key to determine your Horticultural Zone.